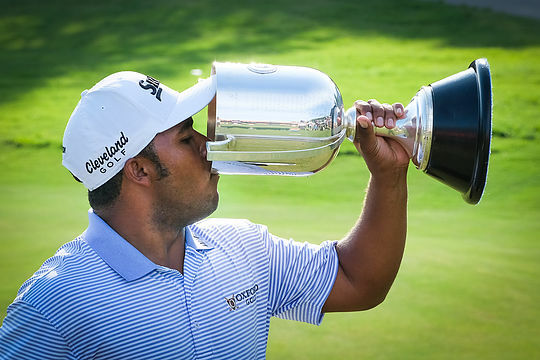 Harold Varner III put last season’s play-off heartbreak behind him to card a closing round of 65 and win his first European Tour title at the Australian PGA Championship. Varner entered the final round 12 months ago in a share of the lead, but a closing 75 in testing conditions at RACV Royal Pines Resort saw the American finish level par and lose out on the first play-off hole to Nathan Holman. This time around on the Gold Coast, Varner teed off two shots behind long-time leader Andrew Dodt, and whilst the two went toe-to-toe in a thrilling battle down the stretch, his second 65 of the week saw him win by two shots on 19 under par. Varner’s victory makes him the first non-Australian to lift the trophy since New Zealander Greg Turner in 1999. “I’m just super excited. After last year, it feels good to come back and finish it off,” said Varner. Queenslander Dodt signed for a bogey-free 69 to sit on 17 under, two shots clear of countryman and 2013 champion Adam Scott. Another Australian, Ashley Hall, was then on 14 under, four shots ahead of his compatriot Brett Rumford, who showed signs of a return to form after a testing 2016 campaign. Varner put a stunning approach to two feet on the third to cut the lead to one shot, and it was not long before he held a share of top spot. He put his approach to 15 feet on the seventh and while Dodt managed to get inside him, it was Varner who made the birdie putt. Both the leaders laid up on the short par four eighth but Varner’s second was inside a foot and we had a new leader. Varner got in trouble off the tee on the ninth but needed just one putt for a third birdie in a row, although his lead stayed at just one shot as Dodt got on in two and made birdie for the fourth time after missing an eight-foot eagle putt. Dodt and Varner then both birdied the tenth but when the leader bogeyed the next, there was a tie at the top once again. Varner bounced straight back as he took advantage of the par five 12th hole, and when he put his approach to the 13th to tap-in range, the lead was up to two. That would not last for long, however, as Varner missed a short putt on the 14th hole to drop a shot and with Dodt holing from 40 feet, things were level again on 17 under par. At that point, Scott was four shots back on three under par for the day, but he holed from similar range for eagle on the 15th to stay in the mix with three to play. A Varner birdie on the same hole moved him back ahead and when Scott saw a birdie putt lip out on the 16th, his chance looked to have gone. Another gain on the 17th then handed Varner a two-shot advantage he would not relinquish up the last. Australian amateur Brett Coletta finished in the group at eight under alongside countryman John Senden and Darius van Driel of the Netherlands. Challenge Tour graduate Ryan Fox was then at seven under, a shot ahead of Stephen Gallacher, Scott Hend, Romain Langasque, Tom Lewis and Prom Meesawat.